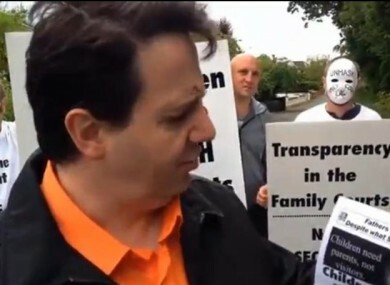 A FATHERS’ RIGHTS group held a protest on Father’s Day outside the home of the Taoiseach. It was initially believed that the group were pro-life campaigners, but a video of the protesters has emerged which shows they visited the home of the Taoiseach to protest about the Irish family courts. We have delivered a letter to Mr Kenny which is signed by myself and delivered with today’s date. The important thing here is we are asking for transparency in family law courts, not secrecy. Children need both parents, they need both parents and not visitors. Fathers need rights too. Egan said that the group are advocating “that Father’s Day should be for every father for every day; that they would have access to see their children”. Niamh Uí Bhriain of the Life Institute said that reports that pro-life activists had carried out a protest at Kenny’s home were “entirely incorrect”. The Taoiseach was heckled by around 200 pro-life protesters when he gave a speech at the unveiling of a Civil War hero’s statue in Ballinalee, Co Longford, yesterday. Demonstrators held banners and placards demanding that Kenny “keep his promise” of refusing to allow abortion in Ireland. Email “Fathers' rights group protests outside Taoiseach's home ”. Feedback on “Fathers' rights group protests outside Taoiseach's home ”.